Track the time spent working on an issue, iteration or the whole project, and compare it to the original estimation. When adding a work item, define the type of work being done, like development, design or testing. 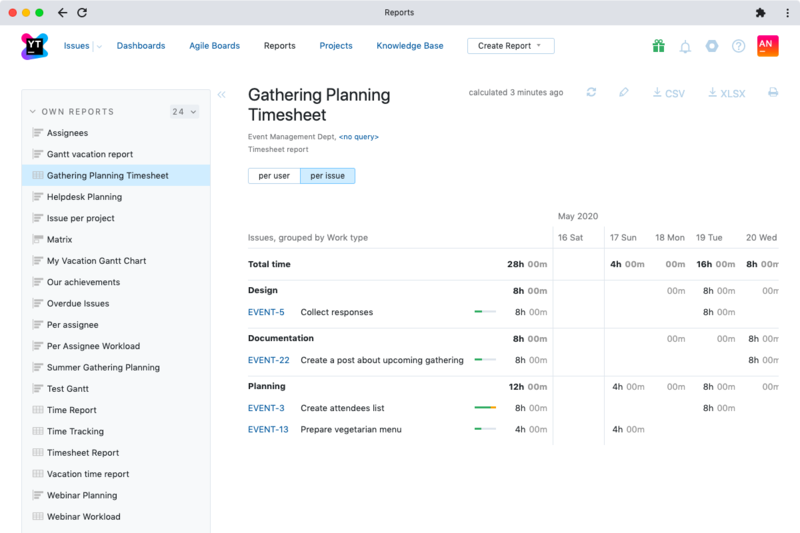 Create Time reports to track the time your team spends implementing specific user story, or the whole project. Use a dedicated Time Tracking tab on the full issue screen to add work items that indicate your progress on a specific issue. Add a comment, specify the type of work done and the date. Use commands to add work items to single or multiple issues in one step. Simply type a command like work Design Today 4h created templates to log your 4 hours of work today spent on designing templates. Estimate the time to complete an issue, and then track the actual time spent as you work on it. Progress for a visual indication of the time left to complete the work against the original estimate. YouTrack calculates the time spent working on a feature or any parent issue by summarizing the time spent working on all its subtasks. This way you can always track your progress on the whole feature or user story. Get clear estimations and spent time totals for your tasks on the Agile board by enabling Time Tracking for your project. 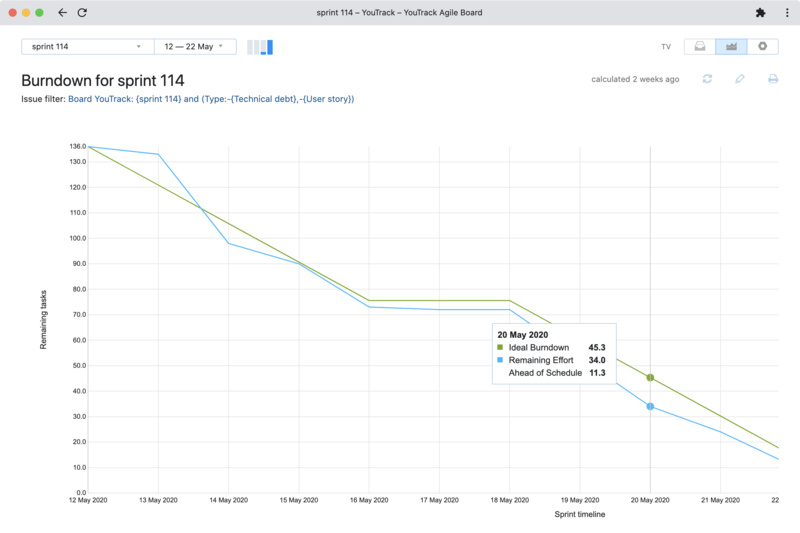 You’ll get the total Estimation/Spent time for the whole sprint, each swimlane, each column and each task on the board. If time tracking is enabled, you can get the Ideal Burndown calculated in actual days and hours according to your Estimation. Remaining effort shows actual time left to complete all tasks, Spent time reflects the total amount of work items added for the current sprint tasks. Track the total time spent working on a specific subsystem, iteration, project(s), during a certain time period. Specify the time period and group your report by the type of work done. You may switch your report view to show time added per user, per issue or per project. Enable the ‘Read/Update Time Tracking’ permission to allow a user to see the Time Tracking tab/add a work item. Estimation and Spent Time fields can be accessed as all custom fields. Enable Time Tracking and create/choose Estimation and Spent Time fields to be used in your project. Attach the default Work Timer workflow to a project to track Spent Time automatically. The workflow tracks the time an issue spends In Progress, and adds an appropriate work item automatically when the issue gets Fixed. Attach Pomodoro Timer to your project(s) to implement the popular time management technique called Pomodoro. This approach focuses on determining how much effort an activity requires, and what usually interrupts your work and stands in the way of your concentration.